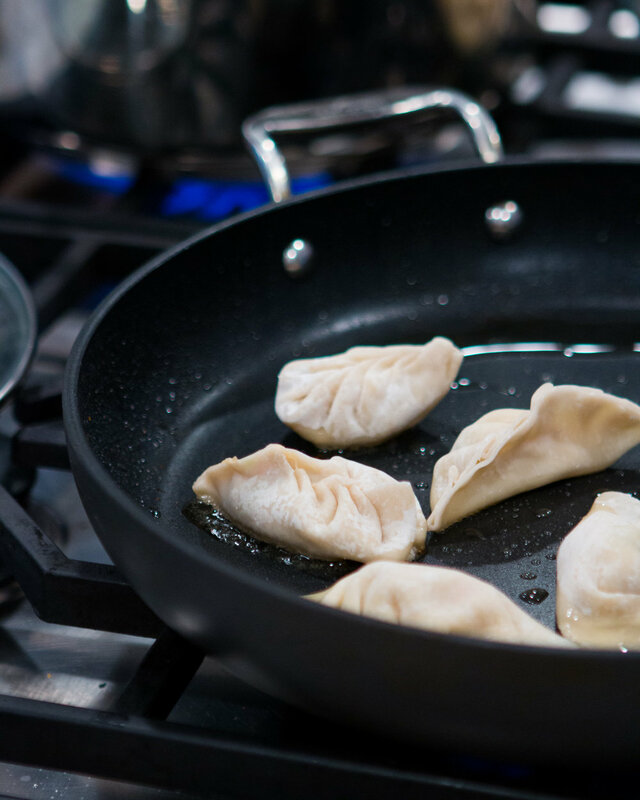 Dumpling Class with Lisa Lin — knead. bake. cook. Lisa also had some very interesting fillings—a chicken filling, a samosa-type filling and a tofu filling. Having never tried tofu in a dumpling filling before, I was impressed with the taste and the texture. I wasn't able to get any photos of the folding process as our hands got quite messy but I did get some photos of the process of cooking dumplings. I only became aware of panfried potstickers later in life (my family always boiled Ling Ling Potstickers) so it was quite the treat to gobble away at some beautifully panfried postickers. They were the most amazing golden brown and perfectly chewy, juicy and savory. Even though I am writing this at my dessert time, I would love a nice warm plate of dumplings as well. Here's to making an effort to practice in the near future!